Death Canyon. 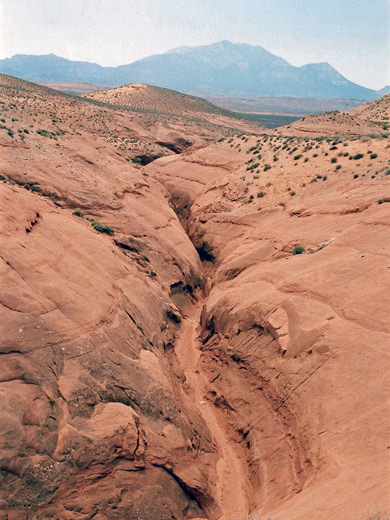 Not the deep, dark, dangerous ravine that its name might suggest, this is just a minor drainage in the Burr Desert, close to North Wash and Utah highway 95, and features a short section of Entrada sandstone narrows with a couple of dryfalls and a pool. But the rocks are nicely colored, the canyon is easy to reach and the surrounding scenery is quite photogenic, featuring an expanse of rolling red slickrock, so it is worth exploring for an hour or two. 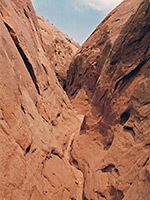 The dry, sandy wash that emerges from the canyon crosses UT 95 half way between mileposts 25 and 24. Vehicles may be parked on the verge at the west side of the road. 6 views of Death Canyon. TopoQuest topographic map of Death Canyon. 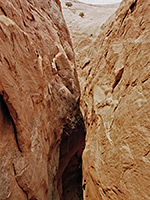 There is little sign of any canyon looking east from the highway, only a low sandstone outcrop about half a mile away, from where the wash begins. The only distinctive feature in this direction is the sharp peak of Turkey Knob (5,499 feet) a little way to the south; otherwise, the area is flat and sandy, though the view west is quite different, dominated by the large peaks of the Henry Mountains. It takes about 10 minutes to walk along the dry streambed, to the point where low cliffs rise, and the wash ends at a pool beneath a dryfall, with a narrow slot above and beyond. The pool seems also to be a spring. This obstacle isn't climbable, so instead the canyon can be re-entered by scrambling up the rocks on the left side then walking back down further along. Downstream, Death Canyon has a pleasant but short slot section - shallow, narrow and curving, it soon reaches a drop of 20 feet beneath 3 wedged chokestones which is perhaps a good place to practise rappelling - then has an even shorter, deeper slot that ends above the pool. 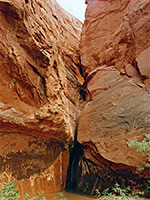 There are no more slots upstream from the re-entry point, as the canyon splits, widens and merges with the surrounding slickrock domes and gullies. A round trip to explore the canyon takes one hour.